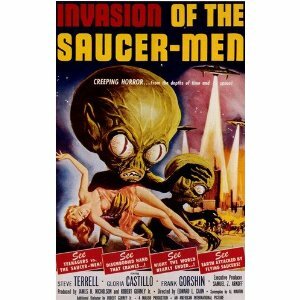 In 1957 a little B-Movie called Invasion of the Saucer Men gave us a great example of man vs creatures from outer space. This film came out during an era where The US was afraid of the Soviets lurking around every corner. Since Orson Wells famous radio broadcast man was terrified of little green men from mars. ( Little did we know years later it would be grey men and we don’t know where they come from but I digress). This began a big wave of creature films where they hunt us, kill us eat us or hatch in side us. The creatures for the most part in these films look very rubbery and were to the point of unbelievable. It was more or less how the story was driven with the film as to whether or not you fully got into it whether these creatures were real or not. Ed Wood greatly helped this with his film Plan 9 From Outer Space. these films with he exception of The day the Earth Stood Still and War of the Worlds. The other films of the era made the aliens look cheesy and weird. Over time with the help of great makeup artist Stan Winston the effects evolved. When Alien came out directed by Ridley Scott, We had at least 80 mins of no alien a little bit here a little bit there. Finally at the end BAM big shock and even today that creature scares the piss out of any one who has never seen it before. Scott, Stan Winston and HR Giger ( the artist behind the aliens looks) gave us a look that would never be forgotten. . Stan Winston was a big help in several more Alien movie where he really made us belive an alien could kill us and not make us laugh our selves to death. Predator is another great example of his work and of how alien creatures have evolved. He was a full torso man looking creature. His body had all the characteristics of a man. He would move very well and not be all jerky. It helps that foam latex had come a long way to help an actor move better than he had before with out all the jerkyness. Alien films have come a long way and with the use of CGI it can help hinder the look of the film or greatly help it. The unknow thing in JJ Abrams Super 8 might also be a great example if we only know what it looked like. With Predators coming out Friday we can see that even good old men in costumes can still be used to mak a great film.